Tiffany’s is a modern, stylish restaurant built within the historic Carnegie Hall. With some of the best views in Dunfermline of the Forth Bridges. Tiffany's Bar is open from 1 hour before performances. Tiffany’s is also available for parties and special events. 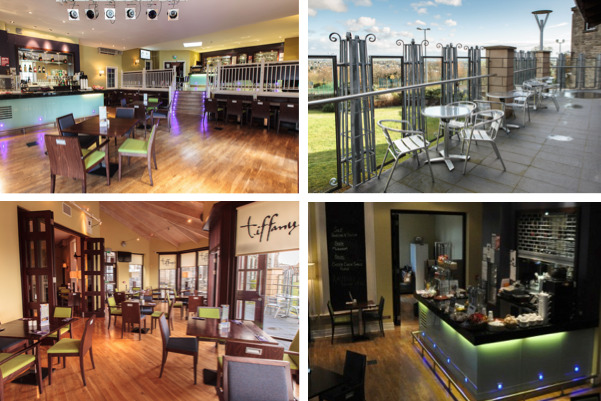 Our beautiful Conservatory is self contained and comfortably provides a secluded dining area for 40, while the whole restaurant seats up to 100 inside plus 20 outside on our seated Terrace. Whatever the occasion, Tiffany’s is the ideal setting, whether it be it a Christening, landmark Birthday party, Wedding Breakfast, Retiral party or Wedding anniversary. We would be happy to assist you in arranging fresh flowers for individual guest tables, as well as a cake if required. Our high spec sound & lighting systems are also available. Tiffany’s is able to host a wide range of corporate gatherings and events from small board room meetings to larger seminars, annual dinners and awards ceremonies. All of our meeting rooms have marvellous views over the Forth Bridges. In addition, we can offer our 501 capacity auditorium, a 120 seater Studio space and our Library and Lecture rooms. You couldn’t ask for a better location – Dunfermline is just off the motorway which links Edinburgh, Glasgow, Dundee and Perth, and is also served by two rail stations. We also have close links with local hotels nearby if accommodation is required. At a time of bereavement, planning hospitality for people close to you can be difficult. Our staff will ensure that your time of remembrance will be treated with the care and respect the day deserves. All of our menus are designed to be flexible and you may be assured that the needs of your family and friends will be attentively catered for.